Providing you the best range of puff online plant, corn puff line, puffs extruders, corn puff machinery, rice corn puff extruder and extruded puff snack machine with effective & timely delivery. Owing to the years of industrial experience, we have been able to serve our valued clients with a wide machine of Puff Online Plant. The offered extruder is precisely designed by our experts using premium quality components and progressive technology. Further, we check this extruder on different parameters before their final dispatch in order to make sure that this is in compliance with the global quality norms. We manufacture and exporters of Corn Puff Making Line at Industry Competitive Prices. We have emerged as the topmost manufacturer, exporter, wholesaler and supplier of Puffs Extruders. This extruder is specially designed to produce extruded snacks such as; snack balls, snack rings, snack sticks, etc. The provided range is massively applauded for its dependability, resistance against abrasion & corrosion, noted performance, longer service life and sturdy construction. Moreover, this extruder is obtainable in varied technical specifications to fulfill the variegated requirements of customers. We have emerged as the topmost manufacturer, exporter, wholesaler and supplier of Extruded Puff Snack Machine.This extruder is specially designed to produce extruded snacks such as; snack balls, snack rings, snack sticks, etc. We have emerged as the topmost manufacturer, exporter, wholesaler and supplier of CheesePuffs Extruders. This extruder is specially designed to produce extruded snacks such as; snack balls, snack rings, snack sticks, etc. The provided range is massively applauded for its dependability, resistance against abrasion & corrosion, noted performance, longer service life and sturdy construction. Moreover, this extruder is obtainable in varied technical specifications to fulfill the variegated requirements of customers. We have emerged as the topmost manufacturer, exporter, wholesaler and supplier of Cheese Puff Making Machine. This extruder is specially designed to produce extruded snacks such as; snack balls, snack rings, snack sticks, etc. We have emerged as the topmost manufacturer, exporter, wholesaler and supplier of Cheese Ball Extruder.This extruder is specially designed to produce extruded snacks such as; snack balls, snack rings, snack sticks, etc. Riding on unfathomable volumes of industrial expertise, we are engaged in offering an excellent assortment of Corn Cheese Ball Extruder. These machines are manufactured by our dexterous professionals using premium quality raw material, allied components and sophisticated technology. Clients can avail these machines in various specifications that can be also easily customized as per the specific need of the clients. Riding on unfathomable volumes of industrial expertise, we are engaged in offering an excellent assortment of Cheese Balls Puff Extruder . These machines are manufactured by our dexterous professionals using premium quality raw material, allied components and sophisticated technology. Clients can avail these machines in various specifications that can be also easily customized as per the specific need of the clients. We have been able to furnish the expectations of our customers by providing highly advanced Puff Snack Extruder that is optimum in functioning. Strong in construction, the snack extruder offered by us is a versatile extruding unit that is used for preparing varied kinds of snacks. Moreover to this, a team of quality professionals stringently examine this snack extruder in order to offer flawless range at clients' end. Our organization is engaged in this domain, we are offering a superior quality Puff Snacks Extruder that is used in snack making industries for preparing snacks ring. Tough in construction, the extruder offered by us is a versatile extruding unit that is used for preparing different kinds of snacks. This extruder can be directly extruded from the extruder, dryer and seasoner, we can produce all kinds of snacks and diverse shapes by adjusting the dies. With heart-earned industrial experience and technical knowledge, we are providing an encompassing range of Soya Nuggets Extruder. Our offered extruder is designed in such a prompt manner that meets various applications in food industry. 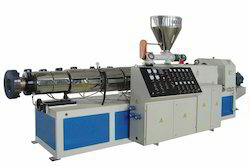 We are supported by highly sophisticated technology in manufacturing of this extruder. Moreover, this is highly appreciated in the market for its reliability. Riding on unfathomable volume of industrial expertise, we are offering wide range of Kurkure Extruder machine. This machine is precisely manufactured by our diligent professionals using high-grade components and leading-edge technology in compliance with set industrial norms. Our offered machine is widely used for squeezing snacks in various food processing industries. Furthermore, this machine can be availed from us in various technical specifications. Our range of extruded corn puff machine is extensively used for apply seasoning to fried, roasted product in uniform manner. The unit comprises of ellipsoidal shaped pan fabricated using stainless steel sheet and mounted on the heavy duty reduction gear box shaft, which is driven by an electric motor. 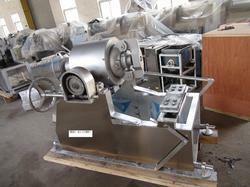 These flavour mixing machine are available in stainless steel 304 or 316 contacting parts. Exterior drum surfaces are available with satin finish or polished to near mirror finish to provide ease in cleaning of the unit. Application of kurkure puff snacks flavoring machines This batch type flavour mixing machine is useful for pellet / kurkure (cheese puffs, cheese curls, cheese balls, cheesy puffs, maize puffs, corn curls, corn cheese) nik naks( extruded corn snack), potato chips, banana chips, fried or roasted nuts, bangle grams or pulses and many fried or roasted food products. Construction Kurkure puff snacks flavoring machines Stainless steel 304 semi ellipsoidal size pan with a circular mouth for charging fried food products pan mounted at an inclination of 45 degrees to the horizontal. Suitable totally enclosed fan cooled motor with suitable worm reduction gear box and pulley arrangement for rotating coating pan. The motor and gear box is mounted inside sturdy mild steel frame and the pan mounted on the gearing housing fitted in the stand. All joints argon arc welded and all stainless steel parts polished to suitable finished required of food processing equipment mild steel parts automotive painted to smooth finish. To meet the diversified requirements of our prestigious clients, we are engaged in offering Corn Puff Machines that have main bearing housing fitted with bearing. Manufactured in line with industry norms using the best quality components and sophisticated technology, these machines are optimum in quality. In addition to this, customers can avail these machines from us in varied designs and specifications at nominal prices. Owing to the dedication of our devoted professionals, we have earned a reputed name in manufacturing, exporting, wholesaling and supplying the finest quality collection of Puff Ball Machine. Widely used in snack making industries for preparing snacks ring, snacks sticks and snacks ball. Provided puff ball machine is high on demand in the industry for its striking attributes like less maintenance and easy installation. We offer this puff ball bending machine in different models in accordance with clients' requirements.